Graeme Kirkpatrick is possibly one of Northern Ireland's most highly qualified tradesmen. Despite some surprise about his move from academia to construction, Graeme is convinced his decision is canny, if not unusual. "I think most of my family were a bit surprised initially when I said I was doing the apprenticeship, however they recognise it's a good opportunity to learn a trade and gain a qualification in a short period of time," he says. "In some ways, I miss the books, but this is an opportunity to do something more hands on. It is lucrative work. "There are opportunities if you have the qualifications and skills. It is a chance I am very happy to have and a passport for travel and working abroad." "It was my own choice and a goal I'd set for myself after my A Levels. Having completed my BSc and MSc, my goal became a PhD," he says. "I had been in full-time education since I was in primary school until this welding opportunity came up. "It is so different being in a welding booth rather than a science lab. There is not so much theory, it is a lot more practical. "You have to practise and practise until you get it right, rather than sitting at a bench in a lab working, weighing and measuring." Graeme, who is doing his course at South Eastern Regional College, Bangor, hopes welding might even be key to his PhD dreams. "The earning potential is good, particularly if you are prepared to travel. 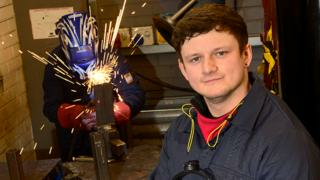 Welding could allow me to self fund if I do a PhD part-time over six years," he says. "I could do the two alongside each other. That could be a plan." With Northern Ireland's construction industry on the mend following a long, deep recession, experts have warned of a growing skills gap. Construction output is expected to sustain a level not far short of £3bn until 2022, a level not seen since 2008, according to the Construction Industry Training Board (CITB). CITB NI chief executive Barry Neilson says difficulties enticing young people into construction had led to "an ageing workforce and retirement time bomb". "Construction is quite buoyant but there is a genuine labour shortage, which has been growing for the last couple of years," he says. "We need to catch up from several years of the recession when employers were not taking on apprentices." Gavin McGuire, from the Federation of Master Builders, estimates that the NI construction industry lost about 25,000 people around the recession. He agrees recruitment for traditional trades is difficult. "It is affecting companies' ability to grow and develop. If fathers and uncles lost their jobs, they were possibly not keen to promote that industry for their children," he says. "We are educating for unemployment yet there are real vocational job opportunities and career chances and we need schools to see that value. We need to redefine apprenticeships."